1937 Mercedes-Benz M125 5.7-litre eight: The F-series engine officially known as the M125. 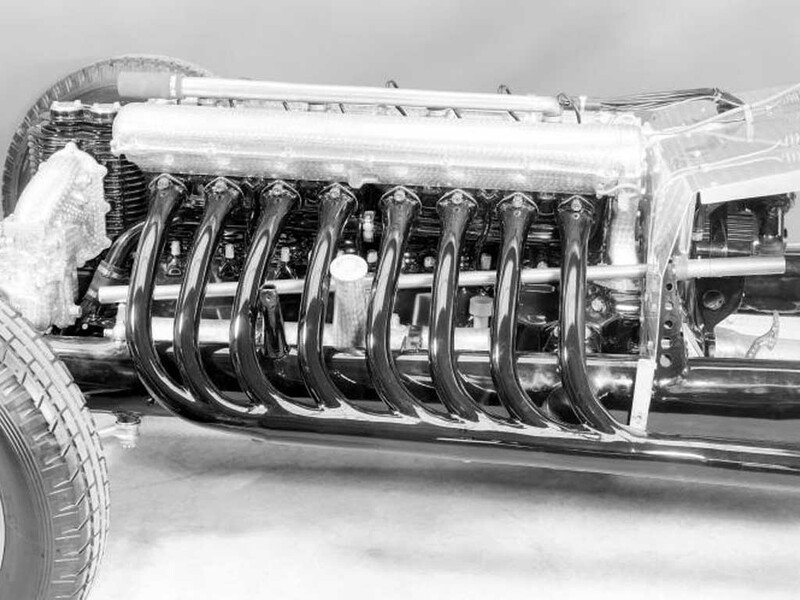 An in-line eight, Daimler-Benz cylinder construction of welded sheet-steel water jackets around forged-steel cylinders was used, built as 2 4-cylinder blocks with integral heads and bolted to an aluminum crankcase, 4 valves per cylinder equally spread at an included angle of 70 degrees, pivoted fingers were interposed between cam-lobe and valve stem. A 1-piece crankshaft with I-section con-rods that had split big ends carrying 2-rows of 8mm diameter rollers by 10mm long. Split Main bearings with 10mm diameter rollers varying in length for each main bearing from 18mm downwards. The engine was built first with 5 main bearings and also with 9 main bearings. 9 mains were ultimately standardized after a failure in early testing. In at least 1 engine, the rod journals closest to the clutch were made with bigger diameter. In 1936 a Hirth build-up crank was also tested for 12 hours on dyno and for 250 miles on Autobahn before 1 of its joining bolts broke. Hirth supplied 6 complete crank and rods assemblies to suit the 9-main-bearing version but these were never seriously committed too because they were 13 per-cent weaker in torsion. Mahle aluminum pistons. Twin up-draught carburetors were pressured by a roots-type supercharger with rotors 106mm diameter and 240mm long. Mounted vertically at front. The M125 weighed 223kg. With the manifold fed from the front end , one problem consistently troubled the M125, the 2 rear spark-plugs in the 2 rear cylinders always ran oily or wet, they had to be replaced with a hotter plug, the Bosch 420, while the others cylinders used a colder 450 plug. The M125 set new highs for horsepower output, on the normal fuel blend used for racing the M125 engines leaving the 2 sheerer test benches were producing between 550 and 575BHP towards the end of 1937. Inlet opens 15 degrees BTDC. Inlet closes 42 degrees ABDC. Exhaust opens 30 degrees BBDC. Exhaust closes 3 degrees ATDC. BHP per litre 103.4BHP per litre. Engine weight per BHP 0.39kg per BHP. Tommy, Re-1937 Mercedes-Benz M125 5.7-litre eight. Valve timing (numbers that made it to print on here) re-checked and are correct. So goes to corrected piston speed. But agree they look strange, but on the other hand a lot of things look strange from on the old era engines. More so on this particular model. This Mercedes-Benz engine was their new F-series engine which was officially known as the M125. It looked much the same as its predecessor but was longer with cylinder-center distance increased from 95mm to 104mm. A cylinder diameter of 94mm having 4-39mm valves seems to me grossly overvalved, but that was the trend back then. Also strange was the 10mm in diameter rollers in the main bearing varying in width from 18mm downward. This engine was initially build with 5 main bearings, but finally with 9. The rod-bearing sizes in at least one engine, the 2 closest to the clutch were 3mm bigger in diameter. The weight of a single aluminum piston for this engine was 0.5kg. expectations for a dramatic power increase had been high since 1936 when induction-system specialist Georg Scheerer first tried a suction carburation system on the 1935-type engine which gave a power increase of 32%, a suction system in which the supercharger draws a fuel/air mixture from the carburetor and then pumps it to the engine, a system which had been widely adopted by competitors Auto Union and Alfa Romeo but were not fondly regarded by Mercedes-Benz at Unterturkheim. Previous to that all their racing engines since 1920 had superchargers blowing through the carburetors (pressure carburetors). These old notes are much more extensive then what is given here, they cover mostly the whole car development of that particular year. But only important notes of interest on engine development that leads to its specification were concentrated upon. Some more important notes that might interest some on this 1937 Mercedes-Benz were. Tests results carried out. “pressure carburettors”:-3000RPM BOOST 6.2PSI AT VALVE 316BHP/750Nm torque. At 5800rpm 13.3PSI AT VALVE 550BHP/675Nm TORQUE. “suction carbuettors”:- 3000RPM 10.2PSI AT VALVE 361BHP/857Nm TORQUE. 5800RPM 11.3PSI AT VALVE 556BHP/683Nm TORQUE. 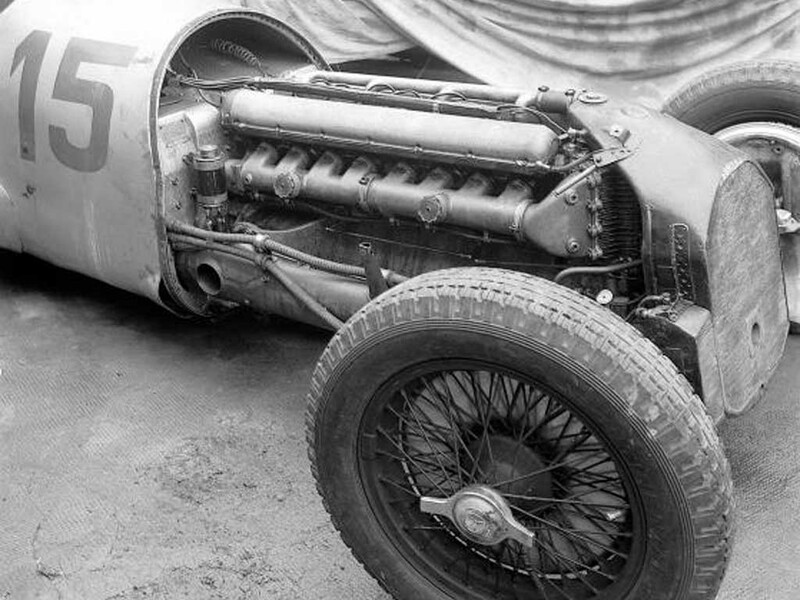 The gear train driving the twin overhead camshafts of the 1937 M125 ran up the back of the engine, were it also turned the Bosch magneto. Mounts for both the pedals and steering gear were integrated with the casting at the rear of the engine. In one of hollus photos above it can be seen that the 2 main chassis rails were oval tubes with round cross tubes as brasses. 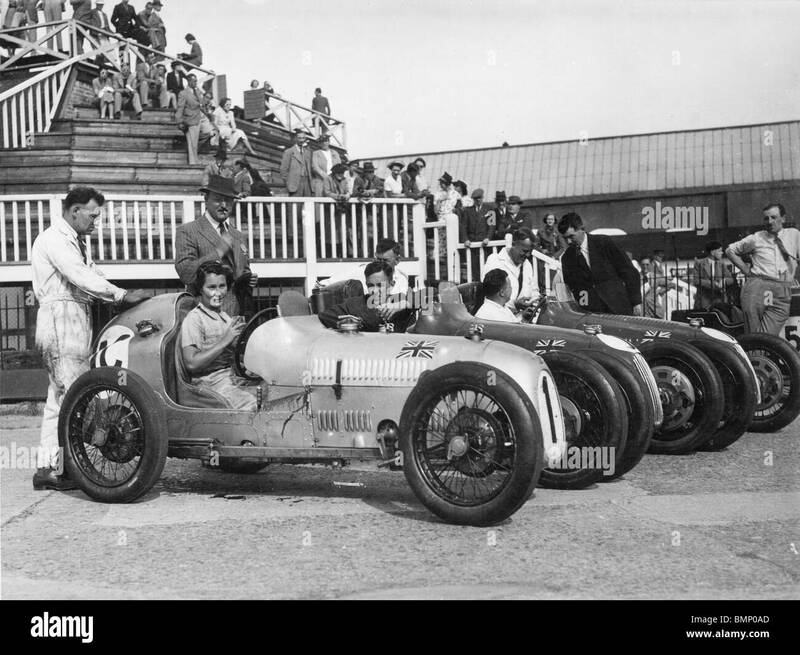 1938 Auto Union D-type 3-litre V12: Robert Eberan von Eberhorst and Werner Strobel carried out a reduction of the 1936 C-type 6-litre V16 concept to create a 3-litre V12. Made in special workshops at Zwickau in small quantities with no special forging dies so many parts had to be machined from solid, often only a 10th of the weight of the original metal blank remained after machining. New engines were broken-in on the dyno for 4 to 5 hours before power runs with the output figures obtained kept secret. 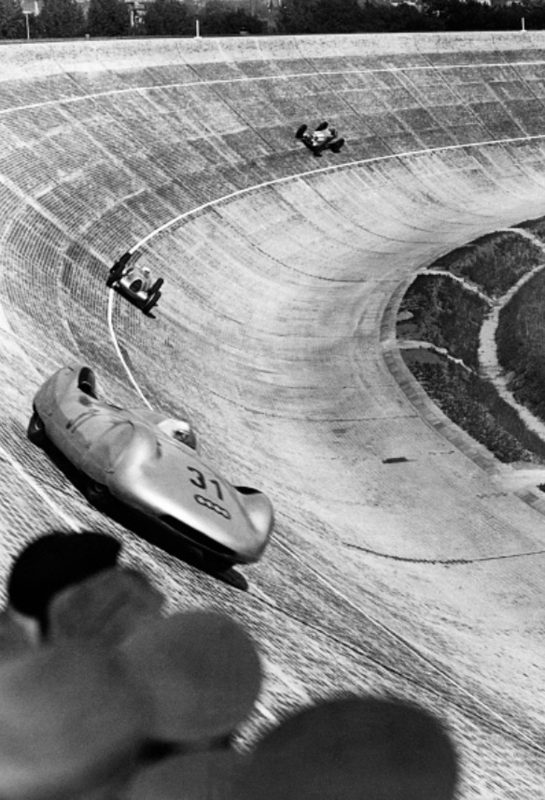 The 1938 D-type V12 resembled the V16 in all its main construction features. Single deep aluminum casting crankcase and cylinder blocks in 1 unit, forged steel wet cylinder liners were deeply spigoted into the block and sealed at top by cylinder heads. Roller main bearings each with 24 rollers 7 by 10mm. the big-ends used 22 rollers each of 7.5 by 11mm all running on a Hirth build-up crankshaft. Equal firing order spacing was achieved by a V-60 degree bank angle. 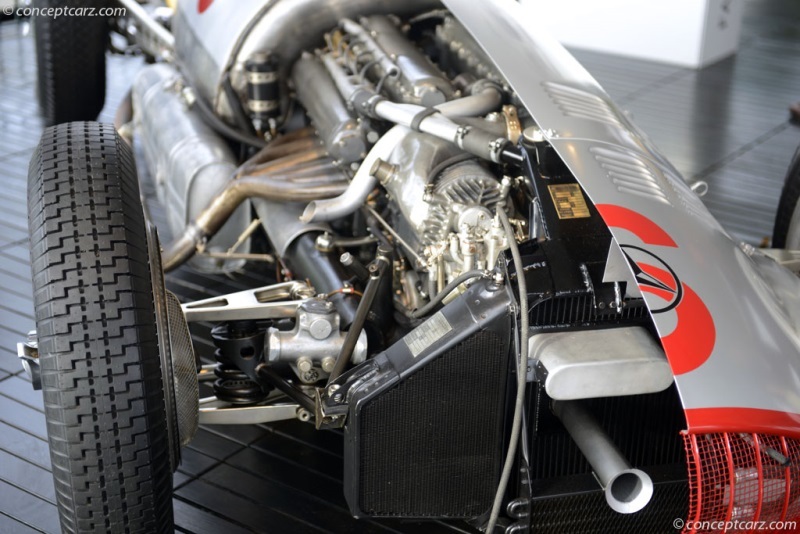 This wider angle spacing ruled out the V16 single camshaft valve gear with its push-rods only to exhaust valves system. A single central camshaft was retained to open the inlet valves through finger type followers, it was driven by vertical shaft and bevel gears at rear, the bevel gear on camshaft was then used to drive a bevel gear on a short cross-shaft which extended out to camshafts along the tops of the exhaust valves, again working through finger followers. The camshafts rotated in plain bearings. 2 valves per cylinder each closed by 2 coil springs. The D-type valve gear was successfully tested at 10k RPM. 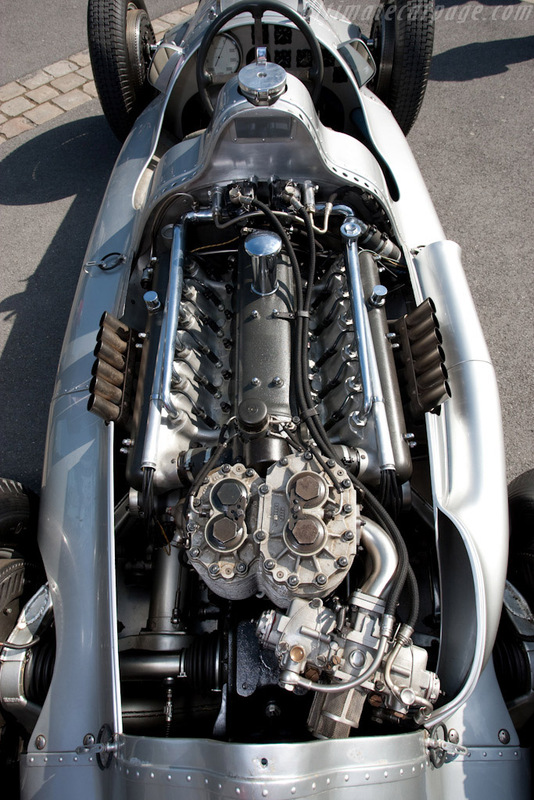 So the D-type was a triple-cam engine with valves equally inclined at an included angle of 90 degrees and rested on inserted bronze seats, the valves were made of cobalt-nickel-alloy steel with 8mm stem. 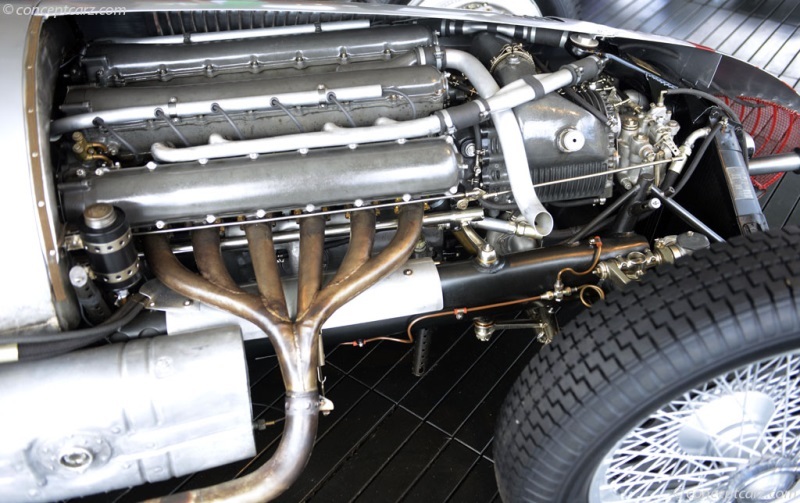 Other changes from the V16 included an additional oil scavenge pump at the front and the use of 3 compression rings above the gudgeon pin and 1 oil ring at bottom on the full skirt Mahle piston. 2 Bosch 6 cylinder magnetos were driven by bevel gears at rear of engine and sparked plugs that were placed centrally. A Roots-type supercharger displacing 1.4 litres per revolution was driven at 2.4 times crank speed up to 17k RPM to produce a boost of 17psi, testing showed that it needed more than 80 HP to drive it. An over and under Solex carburetor was used. Inlet closes 60 degrees ABDC. Exhaust opens 60 degrees BBDC. BHP per litre 87BHP per litre. That SC is half the size of the engine! Thanks again and keep them coming! I look forward to these. 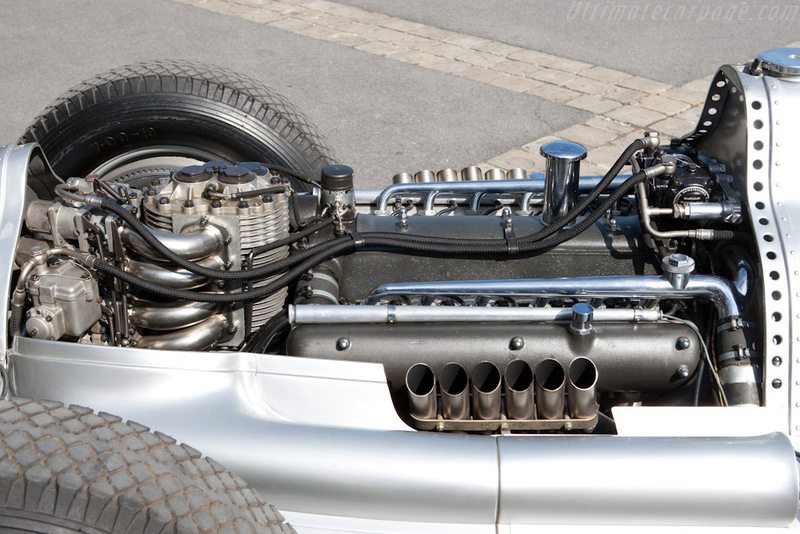 1939 Mercedes-Benz M154/M163 3-litre V12: 60 degree V12’s cylinders individually forged of chrome-alloy steel with integral pent-roof head, were welded to common base flanges to form groups of 3. Complete with their sheet steel ports and water jackets, 3 triple-cylinder blocks spigoted into a high-silicon aluminum crankcase retained by studs. A deep crankcase enveloped the crankshaft which was supported by 7 main bearings. The left hand cylinder bank being offset 18mm ahead of right bank. One piece forged-steel crankshaft with slinger rings to catch oil for big-end bearings lubrication, the front main bearing journal was 8 mm smaller and ran on 10mm rollers, 8mm by 12 mm long rollers were used on big-end journals. Nickel-chrome forged 2 bolt big-end con-rods with serrated joint face were used. These rods were found to be unsafe at speed above 8000RPM. At back of crankshaft a double-roller main bearing was used. A very deep hub shallow flywheel machined around the outside of this hub were the teeth of the drive pinion for the gear train upwards to the 4 camshafts and downwards to the oil pressure and scavenge pumps. Camshafts ran in 4 bearings and acted on finger followers. 4 Valves per cylinder at 60 degrees included angle each with 2 coil springs. The engine was troubled by valve bounce at high speeds and this meant contact with pistons. 2 Roots type compressors operating in parallel with 106mm by 150mm long rotors driven at 1.5 crank speed. And protruding forward from the front of the engines, their pressurized air-fuel mixture was supplied to a single central manifold from which individual branches led downwards to oval inlet ports. BHP per litre 162.1BHP per litre. 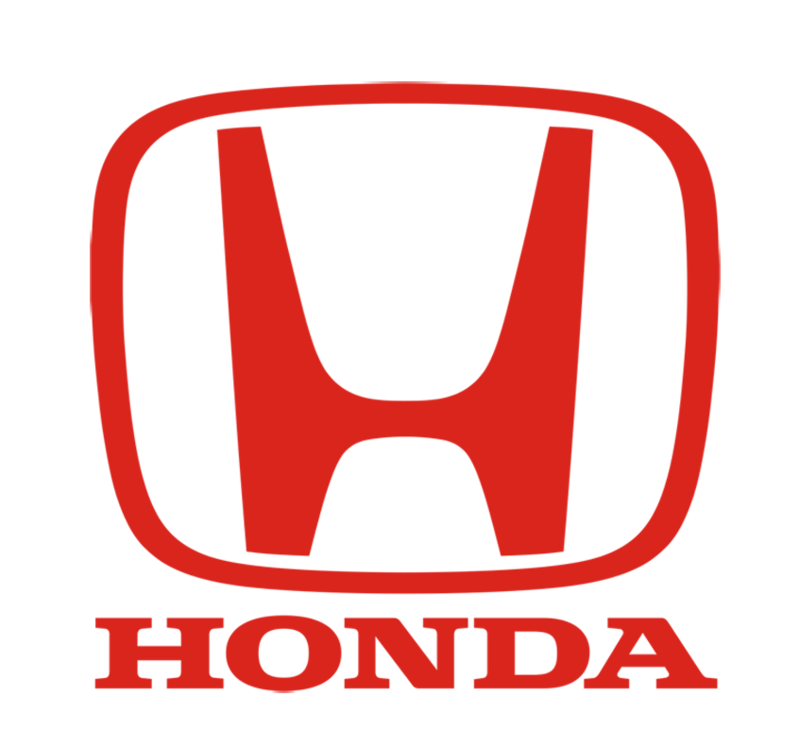 Engine weight per BHP 0.57kg per BHP. Always difficult to interpret valve timing spec's when the lift at which the angles are measured is not stated. The "Pressure Carburettor" (downstream of the supercharger) was favoured (by most teams) for many years, the reason stated being "better throttle response". The suction carburettor is superior in almost every other respect and the difference in throttle response could not be more than perhaps one revolution of the engine - scarcely detectable.